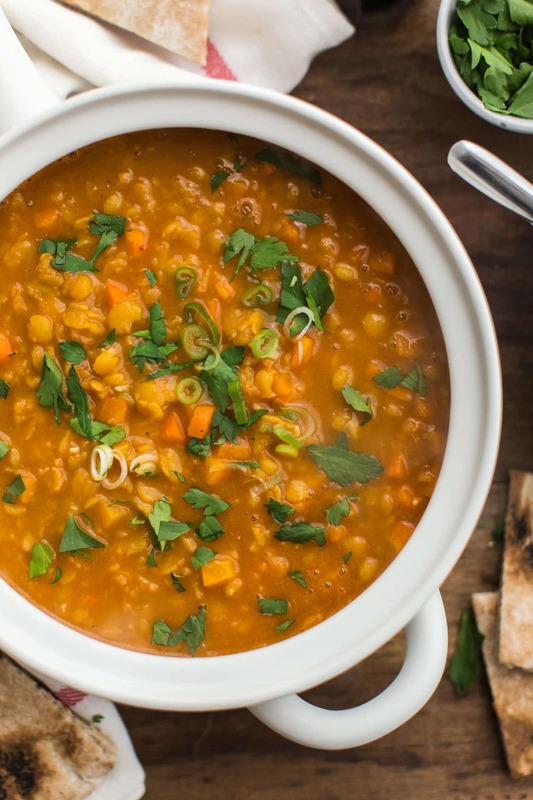 Curry Split Pea Soup with Carrots | Naturally. Coming from the midwest, I miss traditional spring. I miss the thunderstorms and the silly quote that ‘April showers bring May flowers.’ And probably what I miss most is having a good excuse to eat soup on rainy days. This split pea soup is my rainy-day spring soup. It’s bright thanks to the yellow split peas and carrots while still being comforting. Serve it over grains or a side of freshly baked pita or naan (my preference). If you have the time and can find the ingredients, I recommend making your own red curry paste for optimal flavor (I just omit the shrimp paste) but play around with how much you add to the soup based on how spicy you make the paste. Heat a large stock pot over medium heat. Add the shallots and cook until fragrant and soft, 5 to 6 minutes. Stir in the garlic and ginger, cooking for one more minute. Next, add in the curry paste, cooking for another minute. Measure in the stock and water. Bring to a boil, add the split peas, reduce heat to low, and let cook for 35 minutes. After 35 minutes, stir in the carrots and cook for another 10 to 15 minutes until the split peas and carrots are soft. Taste and add salt as needed. Remove from heat and serve with yogurt, cilantro, lime wedges, and scallion greens if desired. + Not every curry paste is created equal. Some are spicy, some are not. Some are full of flavor, some have little flavor. Make your own or try a couple of store-bought brands to find a good one. Sometimes I’ve found the flavor of the curry paste only comes out with an extra pinch of salt. I love split pea soup because it serves as a wonderful base for so many different vegetables. I’ve been eating a lot of carrots recently, which is why I chose to share this version. However, there is easily a different variations for each season. Vegetables: Peas, potatoes, sweet potatoes, summer squash, winter squash- all would work with or in place of the carrots. If using a more tender vegetable, like summer squash, add it in closer to the end of the split peas cooking. Curry Paste: If you don’t want to make you’re own and can’t find the paste in stores, use a good curry powder. It will change the direction of the soup but is still really good. 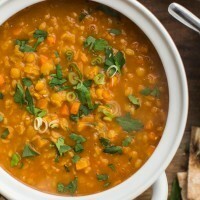 Red Lentils: Can’t find split peas? 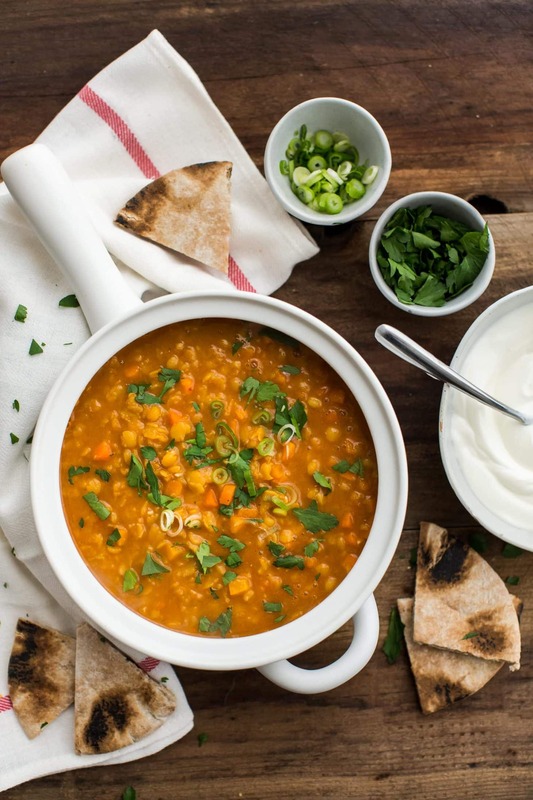 You can use lentils. I like red lentils best as they break down and help to make the soup a bit creamier- just keep an eye on the consistency, you might need to add more water to thin out the soup. I’ll be the first to admit that I do not use split peas near enough in my cooking- I usually just use lentils. 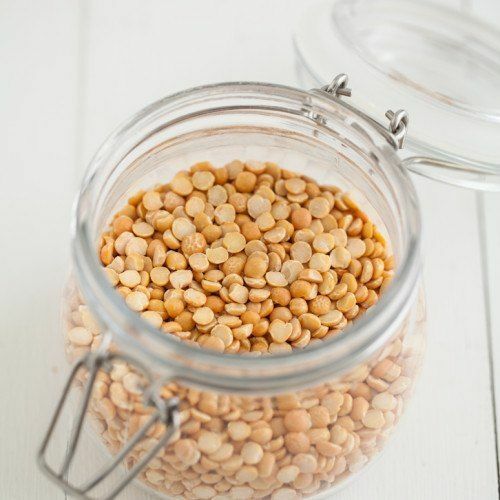 However, they are a wonderful addition to your pantry and make for wonderful soups and even toppings for salads. Or, you can always grind them into a fun (colorful) flour. I Just tried this soup with my wife. I have to say ‘Amazing’!!!! Anyway, Thanks for your recipe. BTW, I love the baked banana chips most…lol..
Hi Betsy- it appears to be working, can I ask what browser/device you are using? So good! This got my 3 year old boy and husband to eat Lentils!